Download "California Civil Code 2782.05"
1 California Civil Code (a) Except as provided in subdivision (b), provisions, clauses, covenants, and agreements contained in, collateral to, or affecting any construction contract and amendments thereto entered into on or after January 1, 2013, that purport to insure or indemnify, including the cost to defend, a general contractor, construction manager, or other subcontractor, by a subcontractor against liability for claims of death or bodily injury to persons, injury to property, or any other loss, damage, or expense are void and unenforceable to the extent the claims arise out of, pertain to, or relate to the active negligence or willful misconduct of that general contractor, construction manager, or other subcontractor, or their other agents, other servants, or other independent contractors who are responsible to the general contractor, construction manager, or other subcontractor, or for defects in design furnished by those persons, or to the extent the claims do not arise out of the scope of work of the subcontractor pursuant to the construction contract. This section shall not be waived or modified by contractual agreement, act, or omission of the parties. Contractual provisions, clauses, covenants, or agreements not expressly prohibited herein are reserved to the agreement of the parties. This section shall not affect the obligations of an insurance carrier under the holding of Presley Homes, Inc. v. American States Insurance Company (2001) 90 Cal.App.4th 571, nor the rights of an insurance carrier under the holding of Buss v. Superior Court (1997) 16 Cal.4th 35. (b) This section does not apply to: (1) Contracts for residential construction that are subject to any part of Title 7 (commencing with Section 895) of Part 2 of Division 2. (2) Direct contracts with a public agency that are governed by subdivision (b) of Section (3) Direct contracts with the owner of privately owned real property to be improved that are governed by subdivision (c) of Section (4) Any wrap-up insurance policy or program. 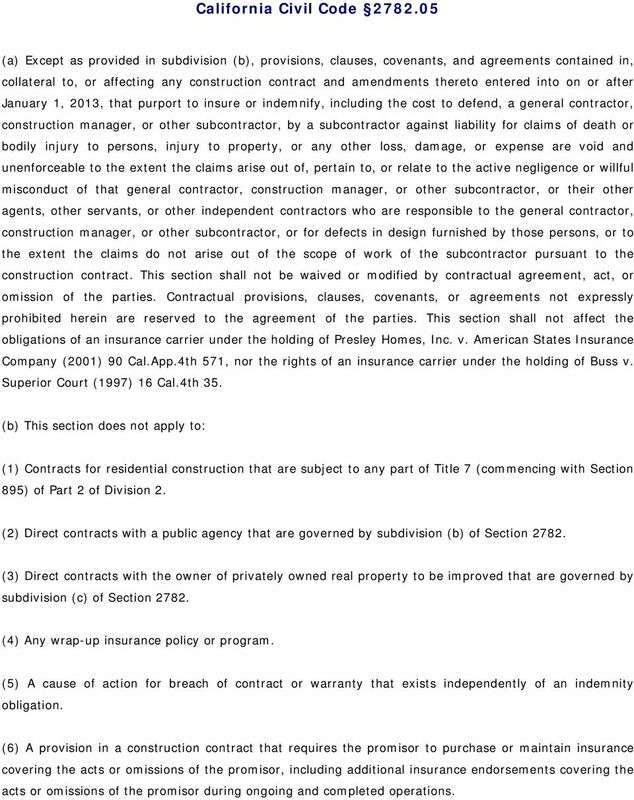 (5) A cause of action for breach of contract or warranty that exists independently of an indemnity obligation. (6) A provision in a construction contract that requires the promisor to purchase or maintain insurance covering the acts or omissions of the promisor, including additional insurance endorsements covering the acts or omissions of the promisor during ongoing and completed operations. 4 have the right to pursue a claim against the subcontractor for any resulting compensatory damages, interest on defense and indemnity costs, from the date incurred, at the rate set forth in subdivision (g) of Section 3260, consequential damages, and reasonable attorney's fees incurred to recover these amounts. The general contractor or construction manager shall bear the burden of proof to establish both the subcontractor's failure to perform under either paragraph (1) or (2) of subdivision (e) and any resulting damages. 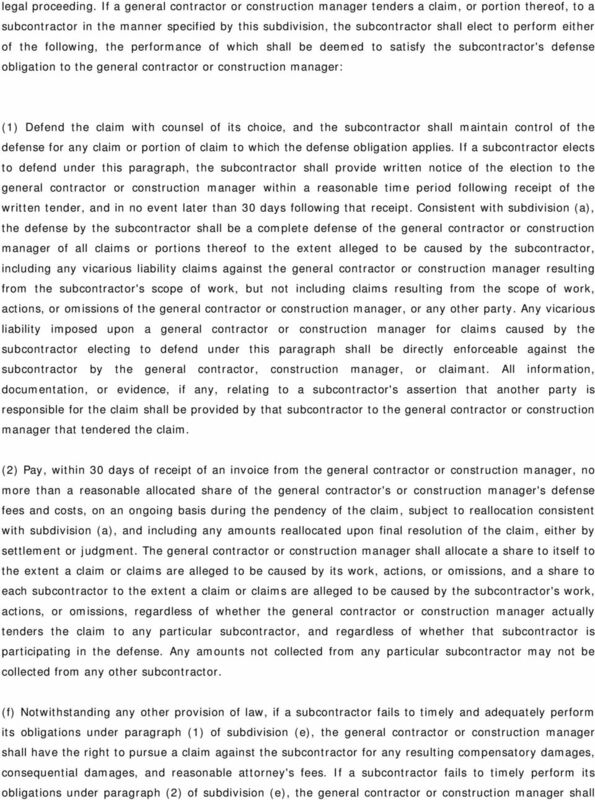 If, upon request by a subcontractor, a general contractor or construction manager does not reallocate defense fees to subcontractors within 30 days following final resolution of the claim, the subcontractor shall have the right to pursue a claim against the general contractor or construction manager for any resulting compensatory damages with interest, from the date of final resolution of the claim, at the rate set forth in subdivision (g) of Section The subcontractor shall bear the burden of proof to establish both the failure to reallocate the fees and any resulting damages. Nothing in this section shall prohibit the parties from mutually agreeing to reasonable contractual provisions for damages if any party fails to elect for or perform its obligations as stated in this section. (g) For purposes of this section, construction manager means a person or entity, other than a public agency or owner of privately owned real property to be improved, who is contracted by a public agency or the owner of privately owned real property to be improved to direct, schedule, or coordinate the work of contractors for a work of improvement, but does not itself perform the work. 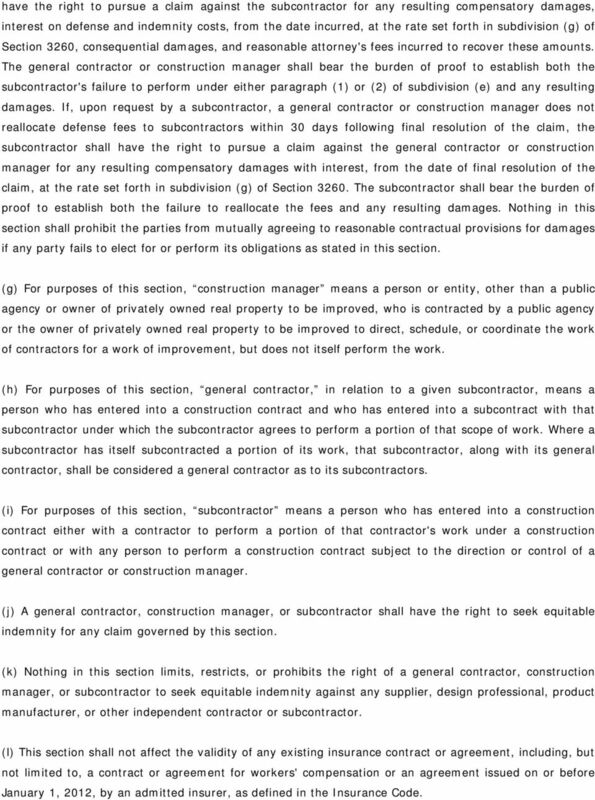 (h) For purposes of this section, general contractor, in relation to a given subcontractor, means a person who has entered into a construction contract and who has entered into a subcontract with that subcontractor under which the subcontractor agrees to perform a portion of that scope of work. Where a subcontractor has itself subcontracted a portion of its work, that subcontractor, along with its general contractor, shall be considered a general contractor as to its subcontractors. (i) For purposes of this section, subcontractor means a person who has entered into a construction contract either with a contractor to perform a portion of that contractor's work under a construction contract or with any person to perform a construction contract subject to the direction or control of a general contractor or construction manager. (j) A general contractor, construction manager, or subcontractor shall have the right to seek equitable indemnity for any claim governed by this section. (k) Nothing in this section limits, restricts, or prohibits the right of a general contractor, construction manager, or subcontractor to seek equitable indemnity against any supplier, design professional, product manufacturer, or other independent contractor or subcontractor. 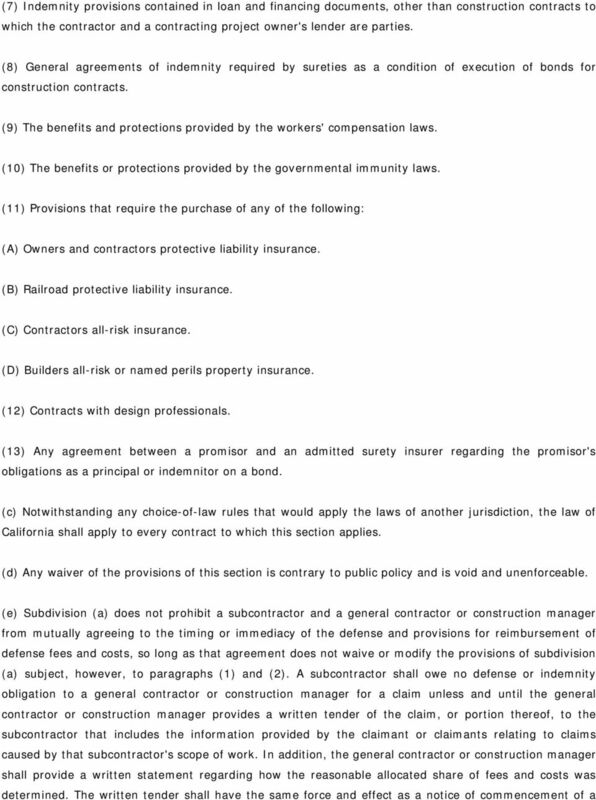 (l) This section shall not affect the validity of any existing insurance contract or agreement, including, but not limited to, a contract or agreement for workers' compensation or an agreement issued on or before January 1, 2012, by an admitted insurer, as defined in the Insurance Code. 5 (m) Nothing in this section shall be construed to affect the obligation, if any, of either a contractor or construction manager to indemnify, including defending or paying the costs to defend, a public agency against any claim arising from the alleged active negligence of the public agency under subdivision (b) of Section 2782 or to indemnify, including defending or paying the costs to defend, an owner of privately owned real property to be improved against any claim arising from the alleged active negligence of the owner under subdivision (c) of Section (n) Nothing in this section shall be construed to affect the obligation, if any, of either a contractor or construction manager to provide or maintain insurance covering the acts or omissions of the promisor, including additional insurance endorsements covering the acts or omissions of the promisor during ongoing and completed operations pursuant to a construction contract with a public agency under subdivision (b) of Section 2782 or an owner of privately owned real property to be improved under subdivision (c) of Section 2782. COMMENTARY. California s New Subcontractor Defense Regime for Non-Residential Projects: Creating Order or Chaos? Indemnity Clauses. Just boilerplate, right?